Taking charge: An extension agent talks to farmers in a field day meeting in Babati District, Tanzania (photo credit: Job Kihara/CIAT). One of the major paradoxes confounding agricultural development researchers today is: Why, in several instances, don’t smallholder farmers adopt agricultural innovations and technologies whose ability to improve livelihoods has been validated through scientific processes? Various arguments have been made to explain the problem on a technology-by-technology basis, but there are few assessments of role played by agricultural extension—often the means through which these technologies are first introduced to farmers—in addressing the problem. 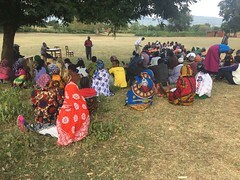 For the past six years, a multinational and multi-institutional team of scientists working first under the United States Agency for International Development (USAID)-funded Africa RISING program and now in the Africa RISING-NAFAKA project, have been engaged in participatory agricultural research and scaling activities aimed at improving the livelihoods of thousands of smallholder farmers in 10 districts of Tanzania. The initial focus of the program (and the scientists) was on validating improved technologies in participatory research with farmers. Now the team is taking the technologies to scale targeting thousands of farmers beyond the communities where the validation was done. This wider focus is changing how the project team is going about the business of agricultural extension. In July 2017, Babati District (one of the 10 Africa RISING focus districts in Tanzania) has been a beehive of activity. Extension personnel from the district, ward, and village levels have been holding farmer field days to share experiences and lessons learned from project activities. Valuable messages about the technologies and practices are being shared in a practical and user-friendly manner, and more importantly, through the most appropriate mediums—the extension staff—who are able to simplify scientific messages on improved technologies because they ‘speak the farmers’ language’. This represents a break from how the previous program’s (Africa RISING) farmer field days were organized. Most of the field days then were largely researcher-led. The change was occasioned by realization that researchers can only conduct a few field days and reach a small number of farmers. 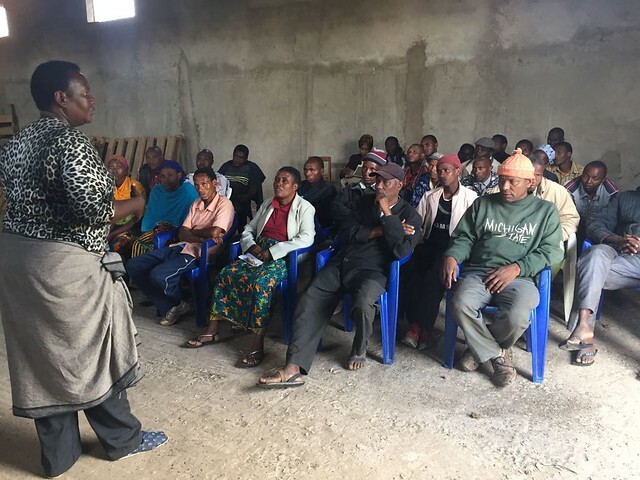 The project team adapted their methods and began working with district, ward, and village extension agents who live and work in the villages. The project team facilitated the agents’ to carry out demos and field days in their villages. ‘The scientists have worked with us and the farmers to set-up demonstration plots where these improved technologies can be observed, we then take-over to educate the farmers through self-organized field days,’ explains Jonas Massam, the acting District Agriculture, Irrigation and Livestock Cooperatives Officer in Babati District. With minimal support from the scientists, the extension agents have conducted field days in 13 villages attracting between 35 and 165 farmers at each event. To ensure that they are not spread too thinly when managing a large number of farmers during a field day, the extension agents have also established a mechanism whereby their colleagues from neighbouring villages come to help when many farmers are expected. A self-organized field day led by the extension agents underway in Babati District (photo credit: Job Kihara/CIAT). ‘The team spirit exhibited by the extension agents is amazing. This kind of effort at the grassroots can quickly transform agriculture for the better. The project will continue providing basic inputs for many more extension personnel to implement demos especially in locations where farmers normally conduct village meetings. I think this will be a good way of utilizing the existing network and local know-how of the agents and farmers,’ says Job Kihara, a senior scientist with CIAT and an agronomist for theAfrica RISING-NAFAKA project. ‘Our work over the past six years is paying off in a big way. It is good to persist with this capacity building effort for extension staff. We have trained them on technology evaluation and participatory economic analysis and it is encouraging to see them now go out on their own and work with farmers during the field days,’ adds Stephen Lyimo, a senior scientist at the Selian Agricultural Research Institute, one of the implementing partners of the Africa RISING – NAFAKA project. Ensuring consistency in messages and information transmitted from researchers to extension personnel and farmers, and ensuring feedback among actors is key for this approach to be effective. First, the extension workers are trained by the scientists on the content and presentation of the messages during the cropping season. Second, the scientists attend the field days, not to lead, but rather to back up the extension staff in the event that a technical question they cannot handle comes up. Third, the extension staff are equipped with reference materials, which already have standardized messages and information that should be passed to the farmers. So far, the topics that farmers have been trained on during the cropping season and seen demonstrated during the field days led by extension staff include: use of improved crop varieties, use of fertilizers especially in fields located on sloping land, appropriate management of farmyard manure, optimum spacing of plants, soil and water conservation measures, and the economic benefits of adopting the improved technologies. Fred Kizito, a senior scientist with the International Center for Tropical Agriculture (CIAT), which is implementing activities under the Africa RISING-NAFAKA project says that ‘this change of tack is a big deal for them. It is the make or break—without the commitment of our local partners (extension staff), we would not go far. The number of farmers we are reaching now with improved technologies and practices would not be possible and more importantly, our impact on the ground would be very limited’. These messages on improving agricultural practices are reinforced with ICT messages from the MWANGA platform to farmers on market opportunities for their produce, and reminders to extension agents to conduct follow-up activities with farmers. The use of a gender-sensitive technology dissemination approach is also a significant change introduced in this enhancement of extension services by the Africa RISING scientists. For example, a field day that lasts 3-6 hours is now done in two parts—the first one involves visiting field demonstration sites in separate groups of male and female farmers and evaluating the performance of the technologies, with each group noting key observations and lessons. This is followed by a separate meetings of women and men to the technologies, their associated benefits, profitability assessment, and a discussion on key messages for moving forward. This process is particularly important because men’s and women’s roles, opportunities, and views of technologies are socially constructed and vary across different societies. Having two separate groups of men and women during the field days therefore helps to ensure that voices of both groups are heard in technology dissemination and fewer gender-biased technologies. Beyond just getting new technologies into the hands of more farmers, this change in approach to extension is expected to lead to the generation of more gender-sensitive technologies by scientists using the feedback from the two farmer groups, enhanced capacity of extension service in remote villages, as well as stronger links and partnership between the international organizations working in Africa RISING and the NAFAKA programs and the national programs and local partners. Tags: Extension. Bookmark the permalink. This article captures most of my thoughts. I agree. Insightful!